Now Available! "THE BRAZILIAN BLING"
"how bare do you dare"... Vajazzling! Just in time for Valentine's Day, get a free bling with your bare brazilian wax in february! Your completely bare bikini wax gets dressed up with a Vajazzle which is a Swarovski crystal tattoo. The crystals -- placed in "the triangle between the hip bone and the pubic bone or belly button" -- should last about a week. If bare is not your speed, we also have your basic bikini, or basic brazilian! Accessorizing your privates is the hottest rage. From crystal flowers to customized favorites, you too can now decorate your own jewels. Whether it’s a special occasion or you just want to sparkle everywhere, you can choose from an assortment of real swarovski crystal designs so you can shimmer and shine. So.. We ask how bare do you dare? Do you let your skin suffer in the winter months? Winter months can be harsh on your skin. This is the time where exfoliation is very important, not only on your face but also for your entire body. Ever notice that you seem to over moisturize or seem to switch to a heavier moisturizer and you still can't seem to get enough moisture? You still feel and see the same tightness, dryness, or flakiness? What's happening is that the extrinsic factors like sun, the environment, air quality, lack of humidity, etc., has a negative effect on our skin by depleting the moisture that we natural produce within our cells leaving them flaky, dehydrated, dull looking, and you also start to show more wrinkles. When you skin has those symptoms, it means that you are building up a layer of dead dry skin cells on top of each other, making it impossible for the newer skin cells (that are underneath the dead-dry layer) get the nutrition and moisture they need. So how can you help the situation so your skin becomes hydrated & smooth? At the spa: we have treatments like microdermabrasion, corrective chemical peels, or resurfacing facials (like the "alpha vital" or a more advanced facial like the "derma-brasion vitamin infusion facial" to keep your skin new, hydrated & smooth. At the spa we have body treatments like mud wraps and glow sugar scrubs. Coming for a spa treatment and then caring for your skin at home will help you keep your skin looking younger, hydrated & refreshed, you will notice that your wrinkles become less noticeable as you keep you skin freshly exfoliated and your body will feel velvety smooth all winter long! Your skin does not need to suffer in the winter months. The power of obtaining beautiful skin is in your hands! 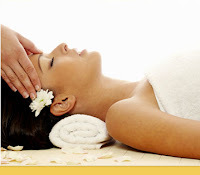 Melt Away Stress Program ~Limited Availability, Awesome Prices! Let us introduce you to a life changing program that will help you achieve a healthier, happier, stress free life by allowing yourself to enjoy a spa visit once a week at a UNBELIEVABLE AFFORDABLE PRICE! Visits to the spa are NOT a luxury. Regular visits to Skin & Beyond should be a part of your preventative health maintenance program. We want you to be able to unwind from every day stress. We want you to be happier, live a stress free life and have some time just for yourself. Our MELT AWAY STRESS PROGRAM will help you become pain free, reduce stress, increase energy, live happier, look younger AND you can look forward to having at least 1 hour per week when no one will bother you, cause you grief, or stress. a simple program that is guaranteed to deliver real results. STRESS FREE & HEALTHY PACKAGE provides you with 5 treatments; a 50 min. Detox Mud Wrap, 50 min. Replenishing Body Treatment, 50 min. Well-Being Facial, 50 min. Reflexology Detox Foot Treatment with Anti-fatigue Leg Treatment, 50 min. Hot Stone Back Treatment. The key to this program is that you have 5 weeks from start to finish to utilize all of your treatments. The total cost for this package-ONLY 358 (you save $287). *We can only accept 30 people into the STRESS FREE & HEALTHY PACKAGE. The name says it all. This program is designed to keep you healthy, happy & forever young! This program helps you to completely remove the environmental stress and pollutants that are killing your body. HEALTHY, HAPPY & YOUNG PACKAGE includes twelve 50 min. treatments. Four 50min. Well Being Facials, four 50 min. Hot Stone Back Treatment, one 50 min. Sugar Glow Body Polish, one 50min. Detox Mud Wrap, one 50 min. Microdermabrasion or Corrective Peel, one. 50 min. Photofacial. HEALTHY, HAPPY & YOUNG PACKAGE requires a 12 week commitment to fully realize the incredible benefits of this very special program. The total cost for this package-ONLY $1,080 (you save $655). This program is limited to the first 8 guests who sign up. Don't wait-call, email, text...do whatever you have to do in order to join us today and start feeling healthier, happier tomorrow. This program is guaranteed to make you feel better with just your first treatment! Once you get any of the packages above all you have to do is show up, relax and feel better! Take care of yourself and you will feel and look your best. You deserve this to start living a healthier, pain-free, stress-free life. P.S: As a special BONUS, everyone who signs up for ANY LEVEL by April 1st will receive a FREE Teeth Whitening Treatment after you finish your MELT AWAY STRESS PROGRAM. But you must sign up by April 1st. P.P.S. The time frames for our MELT AWAY STRESS PROGRAM have been chosen to provide you with optimum physical and mental health benefits. You should know that we are going to make sure you keep to the schedule for you own good. You can also take 50% off any additional treatments during this Program period. Call 615-794-5282 NOW~you have nothing to lose except some wrinkles, toxins & stress!! January is National Staying Health Month. Today we are going to talk about an issue that most people deal with even from birth. 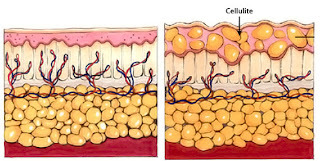 Cellulite can be described as a condition of uneven deposits of fat, water, and wastes that have become trapped in connective tissues of the body, just below the skin's surface. Cellulite occurs primarily in the hips, knees, upper thighs, abdomen, buttocks, and upper arms. Studies of cellulite found the biggest contributor toward a cellulite condition was poor blood circulation. However, toxic accumulation and fluid retention are major contributing factors in the formation of cellulite. Loss of blood flow to an area, whether from lack of exercise, excessive sitting, clogged arteries, or nutrient deficiency, can have a disastrous impact on cellulite formation. According to cellulite experts, cellulite generally accumulates in areas with poor circulation, and as a result, the toxins and waste materials get more clogged and harder to remove. The amount of damage that inhibited blood and lymph flow can do in fragile connective tissue cannot be calculated, but every system of the body is adversely affected when cleansing systems are reduced or blocked. A person does not have to be overweight to have cellulite-thin people are also affected. Lack of blood, lymph and water flow through cellulite prone areas. Slowing down of the body's waste removal system. Hardening of the connective tissue. Cellulite is a toxic body condition! In order to permanently eliminate cellulite, you must start at the source of the toxic body, and detoxify internally. If you have a toxic colon, and in return are hampering the elimination of toxins, you will ALWAYS have cellulite. 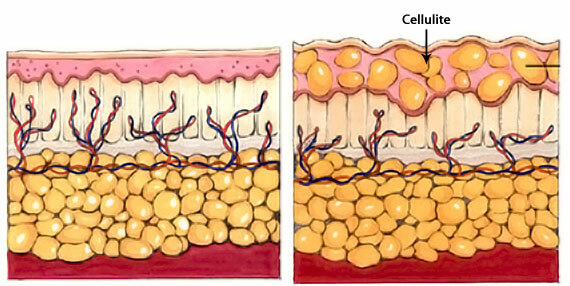 Toxins and puthrefied materials stored in the colon are carried into connective tissues, where they are deposited, forming cellulite. The M'lis Detox Program works hand in hand with the M'lis Body Contour Wrap, not only to enhance the elimination of cellulite, but also to help prevent it's formation in the first place. Body Contour Wrap- to help free and remove trapped waste in the connective tissue, eliminating internal disfiguring deposits and stimulating inch loss. Internal detoxification- it cleanses the systems of the body and the tissues internally. Natural body functions become stronger and more efficient, and established wastes and toxins are eliminated. Eating Cleansing Foods- Fresh fruits and vegetables, whole grains, lean proteins rather than clogging foods, chemicals, and empty calories. Daily Exercise-To encourage circulation and overall health. Body Buff or Body Exfoliants- Helps to exfoliate and remove dead skin cells before the wrap. This helps dilate capillaries, enabling nutrients to get to the cells and activating the metabolism of the skin for better wrap results. Cell-u-rid Formula- Stimulates and strengthens the elimination system. Helps soften and break down cellulite through increased circulation and reduced water retention. Appeases the appetite naturally. Maintain Lotion-A milder form of the spa-strenght Contour Cream that is used at home on cellulite-prone areas to stimulate circulation and continue the contouring process on a daily basis. Crash dieting followed by weight gain. How is the M'lis Body Contour Wrap better than others? M'lis wraps use herbal formulations which work externally to internally. This type of program aids in the removal of wastes that have become trapped in vulnareble parts of our bodies. It is basically a cleansing process of the tissue underneath the skin, and helps restore elasticity to loose, flabby skin. It does not dehydrate and age the skin. This is definately the healthiest type of wrap! Call us if you want to get started or if you have additional questions. We have our first $100 Facial Winner! We have a January winner for the $100 Facial! Congratulations to Micah Smith!!! You are our first $100 facial winner. Please call us at 615-794-5282 or e-mail skinbeyonddayspa@bellsouth.net to book your free $100 facial. You have 3 weeks from today to book your facial. Don't worry for those of you who didn't win, we will have another drawing next month. To enter just book your next visit online on our website, by e-mail or just rebook your next visit at the spa before Jan 31st.